The best time to Bijapur is during winters. Fortified walls surround the old city. The main places to visit within Bijapur are its monuments, which belong to the reign of the Adil Shahi dynasty. The imposing Gol Gumbaz or the Round Dome, which is to the eastern end of the walled city, is the main attraction of this city. Mohammad Adil Shah built it in 1659. This structure has the largest dome, unsupported by pillars, to be found in India and the second largest in the world. It houses the tomb of Mohammad Adil Shah. From the turrets of the Gol Gumbaz, one can have a panoramic view of the city. The medieval complex near the Gol Gumbaz has important buildings. There is an archeological museum and well-maintained gardens near the Gol Gumbaz. Ibrahim Roza, which is on the western outskirts of the city, is a beautiful tomb built by Adil Shah II for his queen. It is an important structure and is known for its highly decorative carving. The citadel, which is situated at the center of the walled city, is a small, fortified area with a moat. It has palaces, pleasure gardens and public halls belonging to the Adil Shahi rulers. Though most of the monuments are in ruins, the remnants of Gagan Mahal are worth seeing. The Sat Manzil (seven-storied palace), Jala Manzil (water pavilion) and the Bara Kaman (twelve arches) are important spots near the citadel. Jama Masjid, the mosque built by Ali Adil Shah I, is an important place to visit. The Taj Bawdi (water tank), Upli Burj (watch tower), the Mehtar Mahal (palace built by sweepers) and Asar Mahal are other important places to visit in Bijapur. The Malik-e-Maidan (monarch of the plains) cannon, which is one of the largest surviving bell-metal cannons in the world, is placed on the city walls and is an important attraction of the city. There are a number of places of interest around Bijapur. The temple town of Aihole, 129 km from Bijapur, has a number of richly carved temples belonging to the Chalukya rulers, dating back to 6th and 8th century. The historic cities of Gulbarga (159 km) and Badami (132 km) can be visited from Bijapur. Basavana Bagevadi (43 km) is known for its temple and is the birthplace of Saint Basaveshwara. Kundalasangama, 67 km from Bijapur, is an important pilgrim center and it is associated with the 12th-century poet and social reformer Saint Basaveshwara. BY RAIL - Bijapur does not have an airport of its own. Bijapur railway station is located 2 km east of the city center, beyond the walled city. Few trains pass and stop at Bijapur. However, there are a number of trains to Sholapur (in the state of Maharashtra) and Gadag, which are important railheads, from where one can get trains to Bangalore, Hyderabad and Mumbai. BY ROAD - The main stand in Bijapur is near the southwestern side of the citadel, near the city center. Bus services to Badami (4 hours), Belgaum (5 hours), Gulbarga (4 hours), Bidar (7 hours), Hubli (4½ hours), and Sholapur (2 hours) are frequent. Auto-rickshaws and tongas can be used to move around the city. Bikes can be taken on rent from the bus stand, on hourly basis. Apart from Karnataka State Tourism Development Council's hotels and lodges, there are a number of hotels in the city to suit all types of budget. Most of the hotels in Bijapur are located on the Station Road/Gandhi Road. Raichur District is known for its rich heritage. Maski in Raichur district is home to an inscription dating back to the time of Emperor Ashoka. The region has been ruled by several dynasties including the Mauryas, Shatavahanas, Kakatiyas, the Rashtrakutas, Vijayanagar kings, Bahmani Sultans and Nizams at different points in history. Evidence of these glorious dynasties are present in the form of the many forts and temples that dot the district. The Raichur fort has been standing tall ever since the time of the Chalukyas of Badami. Later, it was during the reign of the Chalukyas of Kalyana that the fort was renovated. The Kakatiyas of Warangal sought to strengthen the fort further in 1294 AD. According to a Kakatiya edict, the inner tiers of the fort were built during the administration of Vithalanatha, a commander of the army of a prince Goregannayya Reddy who ruled under Rani Rudramma Devi. The Vijayanagara King, Krishnadevaraya, built the north entrance in celebration of one of his conquests, according to some historians. Another fort that draws attention in the Raichur region is the Mudgal fort. This fort, it is said was built in 1053, by a landlord called Muddappa Reddy. There is mention of the same in the Nizamshahi Gazette. The Bahmani Sultans, Vijayanagar kings and the Adil Shahis of Bijapur, all went into war with each other over the conquest of this fort. The Mudgal fort has seen many a battle over the centuries. After the battle of Rakkasatangadi in 1565, the fort fell into the hands of the Adil Shahis. The Mudgal of then, ruled by many dynasties, is now a small town in Lingasugur taluk. Talk about Lingasugur and one has to mention ‘Jaladurga’ a historic fort in the taluk, that was ruled by Vijayanagar kings, Bijapur’s Adilshahis and Bahmani Sultans. The fort is known to have had a huge vault, where riches were stored. There is mention in historical texts that those who were sentenced for life were known to have been pushed from the top of the fort into the river Krishna flowing nearby. Ten kilometres away from Raichur is the Maliabad fort, which was strengthened during the time of the Kakatiyas in the 13th century. The outer layer of the fort was built in the 15th century. 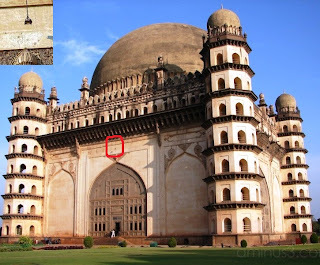 A popular Adil Shahi legend has it that the kings of that dynasty had chased and caught a “bolt of lightning and later hung it in front of the world famous Gol Gumbaz in Bijapur.” And that ‘bolt of lightning’ can be spotted even today! Tied in a tripod-like ring and hung through a solid rust-resistant steel chain on the facade of the Gol Gumbaz, the ‘bolt of lightning’ that can be seen only from a close angle, has been a subject of curious debate for people in this part of Karnataka for centuries. Known as sidilu among local people, this object is in reality a piece of meteorite. There is an interesting story associated with the meteorite. A story that talks of the Adil Shahi Sultans’ faith in astrology and how the meteorite metamorphosed into ‘lightning’. Local legend has it that the meteorite landed in a village where the Gol Gumbaz was being constructed. 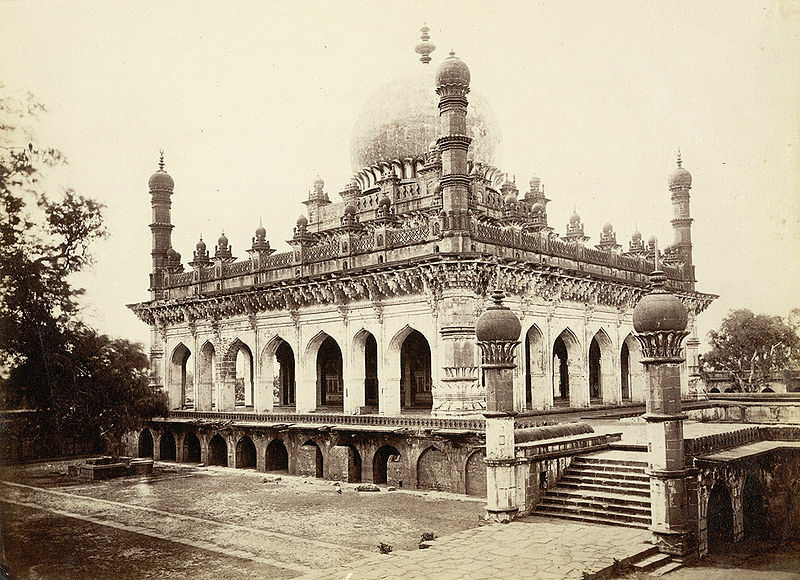 On hearing the news, Mohammed Ali Adil Shah, who built the Gol Gumbaz, personally went to the site to bring the piece of rock from space in a grand procession. A strong believer in astrology, King Mohammed Ali thought it was a good omen and would help him expand his kingdom further if it was preserved safely. Therefore, he brought the meteorite and hung it on the facade of the Gol Gumbaz. This meteorite was almost forgotten after the Adil Shahi dynasty collapsed in the late 17th century. Later, many stories were concocted around it and there was an aura of mystery surrounding the meteorite. But it was Henry Cousens, a British officer who served as the chief archaeology officer in Western India in 1896, who re-discovered and recorded it. Talking about this artefact in his magnum opus ‘Ruins of Bijapur City,’ Cousens says, “This is a rare piece of rock and believed to bring good luck to those who possess it. Therefore, Mohammed Ali Adil Shah might have brought and dangled it before the Gol Gumbaz.” H Venkateshaiah, the Regional Director of the Archeological Survey of India (ASI), also endorses this theory. 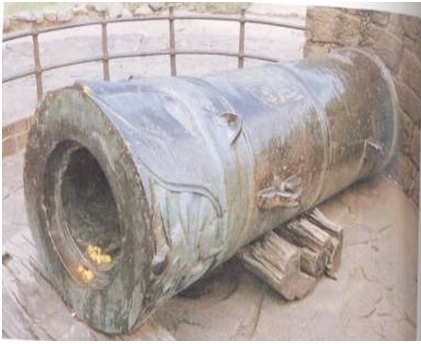 After the Adil Shahis, only Cousens had the opportunity to touch this object during the Gol Gumbaz renovation during his period. There were no proper records available about this meteorite after the Adil Shahi dynasty ended. Because it resembles lightning, a majority of people in the region still think that it causes havoc when it strikes. They continue to believe that it was the great Adil Shahi kings who chased and caught ‘lightning’ and later hung it in front of the Gol Gumbaz, without verifying the authenticity of the information.Ironically, in an era of huge advancements in science and technology, people in the region refuse to believe that it is a meteorite. The beautiful Ibrahim Rauza (1627) is the mausoleum complex where Ibrahim Adil Shah II is buried with his queen, Taj Sultana. Exceptionally conceived and finely decorated, it is one of the supreme achievements of the Adil Shahis. Designed by a Persian architect, Malik Sandal, the tomb and a mosque are set in a walled garden facing each other over an ornamental pond. Graceful minarets mark the corners of each building, surmounted by a dome rising from a lotus petal base. The tomb is supposed to have been an inspiration for the Taj Mahal at Agra.